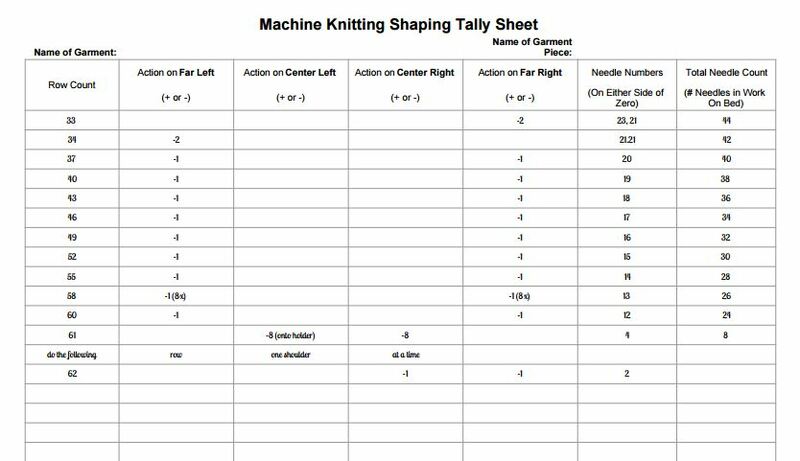 Free Printable Shaping Tally Sheet for Machine Knitting, so you never lose your place, again! The text pattern below (in green) is translated to row counts and shaping directions, in the chart below, in order to make the increases and decreases easier to follow if your knitting is frequently interrupted. Cast on 46 sts in WY, using KP2 and open edge method. Knit 6 rows, ending COR. Change to MY. Work even for 10 rows. You may wish to work a turn or picot row halfway. To complete the hem, graft the cast-on sts to the last row worked. Change to KP3, reset row counter to 0. Knit 32 rows. COR. Armhole shaping. Cast off 2 sts at beginning of next 2 rows. COR. Raglan shaping. Dec 1 st at armhole end(s) of every 3rd row 8 times, then dec 1 st at armhole end(s) of every 2nd row. Continue until 60 rows total, with 24 sts remaining. Then shape neckline as follows, continuing raglan shaping AT THE SAME TIME. Shape neck. COR. Thread center 16 sts to WY. 4 sts each side. Right neck. LH needles in HP. Continue armhole shaping. Dec 1 st at neck edge every row once, until 2 sts remain.